Fiery red vibrations, this classy bouquet of red roses will surely leave her breathless! It is the perfect birthday gift and will make an impression on occasions like anniversaries, Mother’s Day or any other celebrations. 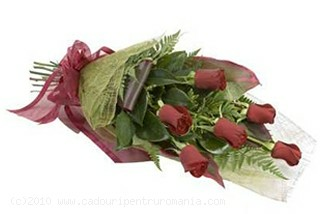 The gorgeous bouquet contains 5 delicate red roses. Each rose bouquet is accompanied by a greeting card with your message.